The China-Japan Rivalry Renewed: Will Asia's Geopolitical Balance Shift Once Again? Forty years after China and Japan first commenced normalized diplomatic relations, a group of islands – known as Diaoyu and Senkaku respectively – is now threatening to reignite past rivalries, including both nations’ claims to geopolitical power in the region. Behind the dispute lies several considerations, including handling internal and international political relationships, which both countries must now resolve in order to avoid a military conflict. September 29 will mark 40 years of normalized diplomatic relations between China and Japan, two countries that spent much of the 20th century in mutual enmity if not at outright war. The anniversary comes at a low point in Sino-Japanese relations amid a dispute over an island chain in the East China Sea known as the Senkaku Islands in Japan and Diaoyu Islands in China. These islands, which are little more than uninhabited rocks, are not particularly valuable on their own. However, nationalist factions in both countries have used them to enflame old animosities; in China, the government has even helped organize the protests over Japan's plan to purchase and nationalize the islands from their private owner. But China's increased assertiveness is not limited only to this issue. Beijing has undertaken a high-profile expansion and improvement of its navy as a way to help safeguard its maritime interests, which Japan – an island nation necessarily dependent on access to sea-lanes – naturally views as a threat. Driven by its economic and political needs, China's expanded military activity may awaken Japan from the pacifist slumber that has characterized it since the end of World War II. The current tensions surrounding the disputed islands began in April. During a visit to the United States, Tokyo Governor Shintaro Ishihara, a hard-line nationalist known for his 1989 book The Japan That Can Say No, which advocated for a stronger international role for Japan not tied to U.S. interests or influence, said that the Tokyo municipal government was planning to buy three of the five Senkaku/Diaoyu islands from their private Japanese owner. Ishihara's comments did little to stir up tensions at the time, but subsequent efforts to raise funds and press forward with the plan drew the attention and ultimately the involvement of the Japanese central government. The efforts also gave China a way to distract from its military and political standoff with the Philippines over control of parts of the Spratly Islands in the South China Sea. For decades, Tokyo and Beijing generally abided by a tacit agreement to keep the islands dispute quiet. Japan agreed not to carry out any new construction or let anyone land on the islands; China agreed to delay assertion of any claim to the islands and not let the dispute interfere with trade and political relations. Although flare-ups occurred, usually triggered by some altercation between the Japanese coast guard and Chinese fishing vessels or by nationalist Japanese or Chinese activists trying to land on the islands, the lingering territorial dispute played only a minor role in bilateral relations. However, Ishihara's plans for the Tokyo municipal government to take over the islands and eventually build security outposts there forced the Japanese government's hand. Facing domestic political pressure to secure Japan's claim to the islands, the government determined that the "nationalization" of the islands was the least contentious option. By keeping control over construction and landings, the central government would be able to keep up its side of the tacit agreement with China on managing the islands. China saw Japan's proposed nationalization as an opportunity to exploit. Even as Japan was debating what action to take, China began stirring up anti-Japanese sentiment and Beijing tacitly backed the move by a group of Hong Kong activists in August to sail to and land on the disputed islands. At the same time, Beijing prevented a Chinese-based fishing vessel from attempting the same thing, using Hong Kong's semi-autonomous status as a way to distance itself from the action and retain greater flexibility in dealing with Japan. As expected, the Japanese coast guard arrested the Hong Kong activists and impounded their ship, but Tokyo also swiftly released them to avoid escalating tensions. 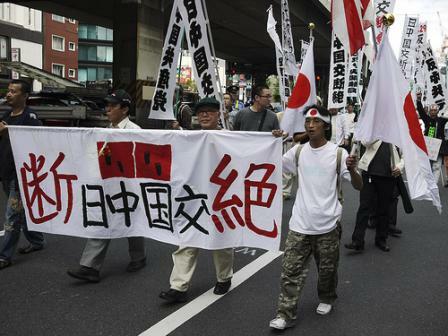 Less than a month later, after Japan's final decision to purchase the islands from their private Japanese owner, anti-Japanese protests swept China, in many places devolving into riots and vandalism targeting Japanese products and companies. Although many of these protests were stage-managed by the government, the Chinese began to clamp down when some demonstrations got out of control. While still exploiting the anti-Japanese rhetoric, Chinese state-run media outlets have highlighted local governments' efforts to identify and punish protesters who turned violent and warn that nationalist pride is no excuse for destructive behaviour. Presently, both China and Japan are working to keep the dispute within manageable parameters after a month of heightened tensions. China has shifted to disrupting trade with Japan on a local level, with some Japanese products reportedly taking much longer to clear customs, while Japan has dispatched a deputy foreign minister for discussions with Beijing. Chinese maritime surveillance ships continue to make incursions into the area around the disputed islands, and there are reports of hundreds or even thousands of Chinese fishing vessels in the East China Sea gathered near the waters around the islands, but both Japan and China appear to be controlling their actions. Neither side can publicly give in on its territorial stance, and both are looking for ways to gain politically without allowing the situation to degrade further. The islands dispute is occurring as China and Japan, the world's second- and third-largest economies, are both experiencing political crises at home and facing uncertain economic paths forward. But the dispute also reflects the very different positions of the two countries in their developmental history and in East Asia's balance of power. China, the emerging power in Asia, has seen decades of rapid economic growth but is now confronted with a systemic crisis, one already experienced by Japan in the early 1990s and by South Korea and the other Asian tigers later in the decade. China is reaching the limits of the debt-financed, export-driven economic model and must now deal with the economic and social consequences of this change. That this comes amid a once-in-a-decade leadership transition only exacerbates China's political unease as it debates options for transitioning to a more sustainable economic model. But while China's economic expansion may have plateau-ed, its military development is still growing. The Chinese military is becoming a more modern fighting force, more active in influencing Chinese foreign policy and more assertive of its role regionally. The People's Liberation Army Navy on Sept. 23 accepted the delivery of China's first aircraft carrier, and the ship serves as a symbol of the country's military expansion. While Beijing views the carrier as a tool to assert Chinese interests regionally (and perhaps around the globe over the longer term) in the same manner that the United States uses its carrier fleet, for now China has only one, and the country is new to carrier fleet and aviation operations. Having a single carrier offers perhaps more limitations than opportunities for its use, all while raising the concerns and inviting reaction from neighbouring states. Japan, by contrast, has seen two decades of economic malaise characterized by a general stagnation in growth, though not necessarily a devolution of overall economic power. Still, it took those two decades for the Chinese economy, growing at double-digit rates, to even catch the Japanese economy. Despite the malaise, there is plenty of latent strength in the Japanese economy. Japan's main problem is its lack of economic dynamism, a concern that is beginning to be reflected in Japanese politics, where new forces are rising to challenge the political status quo. The long-dominant Liberal Democratic Party lost power to the opposition Democratic Party of Japan in 2009, and both mainstream parties are facing new challenges from independents, non-traditional candidates and the emerging regionalist parties, which espouse nationalism and call for a more aggressive foreign policy. Even before the rise of the regionalist parties, Japan had begun moving slowly but inexorably from its post-World War II military constraints. With China's growing military strength, North Korea's nuclear weapons program and even South Korean military expansion, Japan has cautiously watched as the potential threats to its maritime interests have emerged, and it has begun to take action. The United States, in part because it wants to share the burden of maintaining security with its allies, has encouraged Tokyo's efforts to take a more active role in regional and international security, commensurate with Japan's overall economic influence. Concurrent with Japan's economic stagnation, the past two decades have seen the country quietly reform its Self-Defence Forces, expanding the allowable missions as it re-interprets the country's constitutionally mandated restrictions on offensive activity. For example, Japan has raised the status of the defence agency to the defence ministry, expanded joint training operations within its armed forces and with their civilian counterparts, shifted its views on the joint development and sale of weapons systems, integrated more heavily with U.S. anti-missile systems and begun deploying its own helicopter carriers. China is struggling with the new role of the military in its foreign relations, while Japan is seeing a slow re-emergence of the military as a tool of its foreign relations. China's two-decade-plus surge in economic growth is reaching its logical limit, yet given the sheer size of China's population and its lack of progress switching to a more consumption-based economy, Beijing still has a long way to go before it achieves any sort of equitable distribution of resources and benefits. This leaves China's leaders facing rising social tensions with fewer new resources at their disposal. Japan, after two decades of society effectively agreeing to preserve social stability at the cost of economic restructuring and upheaval, is now reaching the limits of its patience with a bureaucratic system that is best known for its inertia. Both countries are seeing a rise in the acceptability of nationalism, both are envisioning an increasingly active role for their militaries, and both occupy the same strategic space. With Washington increasing its focus on the Asia-Pacific region, Beijing is worried that a resurgent Japan could assist the United States on constraining China in an echo of the Cold War containment strategy. We are now seeing the early stage of another shift in Asian power. It is perhaps no coincidence that the 1972 re-establishment of diplomatic relations between China and Japan followed U.S. President Richard Nixon's historic visit to China. The Senkaku/Diaoyu islands were not even an issue at the time, since they were still under U.S. administration. Japan's defence was largely subsumed by the United States, and Japan had long ago traded away its military rights for easy access to U.S. markets and U.S. protection. The shift in U.S.-China relations opened the way for the rapid development of China-Japan relations. The United States' underlying interest is maintaining a perpetual balance between Asia's two key powers so neither is able to challenging Washington's own primacy in the Pacific. During World War II, this led the United States to lend support to China in its struggle against imperial Japan. The United States' current role backing a Japanese military resurgence against China's growing power falls along the same line. As China lurches into a new economic cycle, one that will very likely force deep shifts in the country's internal political economy, it is not hard to imagine China and Japan's underlying geopolitical balance shifting again. And when that happens, so too could the role of the United States. Rodger Baker is the Vice-President of East Asia Analysis at the private intelligence corporation Stratfor. He leads a global team of analysts, focusing on topics such as global political and economic affairs, U.S.-Chinese relations and East Asian politics. Understanding the China-Japan Island Conflict is republished with permission of Stratfor.